With EthniiChic, we are trying to present handcrafted jewelry, accessories and home décor that are at par with modern fashion & culture with a true imbibe of age old art which runs through generations in India. You can see hand painted/ hand crafted Trays, Coasters, Jewel boxes, Votive stands, etc. in our Home Décor product range. Elicit the art lover in you. Ethnichic presents clothing, accessories and home décor with handmade paintings from the traditional art forms across India to add splendour to your elegance. 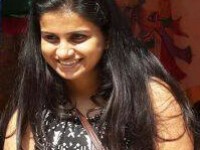 The founder Roshni Puthukudy is an artist at heart and a engineer by profession. She left her lucrative job to follow her heart. The traditional art forms had always excited her. So her genre of work is always inclined to these art forms. All the products from EthniChic are with ethnic and traditional art forms from various parts of India, but meant for the modern world. And the name itself symbolises the concept. Ethnic designs for Chic selections. A true combination of the modern women who is far ahead of her time but still wants to be connected to her roots. Ethnichic looks at each creation as an art piece rather than attire or an accessory. Each piece of work elaborates our epics and ancient Indian mythology. Ethnichic designs are a true medley of art & are purely based on deep devotion and commitment for art. All the creations are handmade with utmost passion and care! Ethnichic is trying to bring back the fast depleting art forms of rural India onto the most showable way of our love towards art – on our attire & accessories. Ethnichic designs promise to be a head turner & a crowd puller. What better way to showcase your immense love to Indian art forms than wearing it on. So come on in to explore the elite and enthralling Ethnichic designs. 1. We care for your products and we partner with reputed Courier companies only. 2. Items in stock shall be shipped within a maximum of 5 days of placing the order. 3. You will be notified about the package tracking information via email as soon as your product is shipped. 1. Order cancellations can be done only before the shipment is made. Once shipped the order cannot be cancelled or changed. 2. Goods once sold will not be taken back. 3. Any damages during the shipping should be intimated within 24 hours of receiving the shipment with photo proof. A free replacement shall be provided by mutual agreement. In case a replacement is not possible full refund shall be given. The replacement or refund are subjected to the return of the damaged items. 4. Custom made items, made specifically for you, cannot be cancelled/returned.